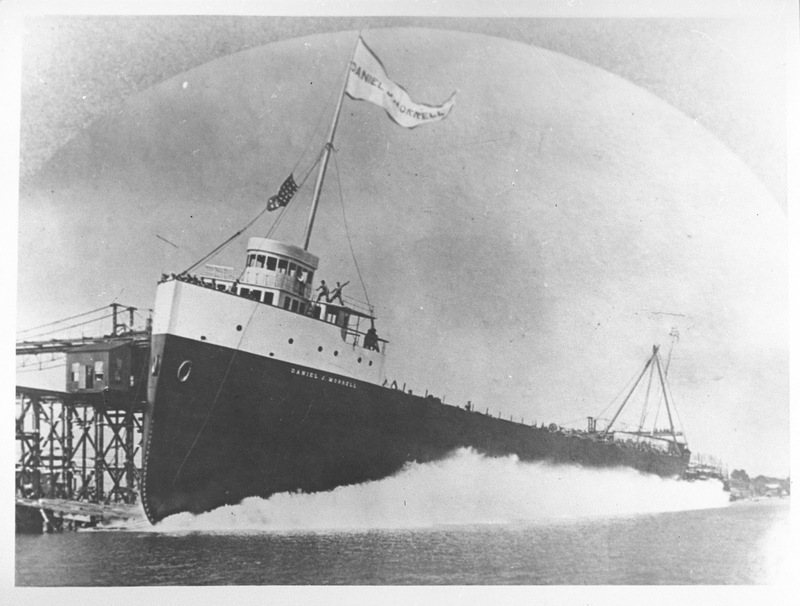 was one of only a handful of 600-foot freighters at the time of her launching in 1906. An excerpt (modified from the Prologue) from the forthcoming book Torn in Two: The Sinking of the Daniel J. Morrell and One Man's Survival on the Open Sea by Michael Schumacher. We are giving away advances of Torn in Two. Sign up for a chance to win here. Deadline for entry is June 30, 2016. Dennis Hale pulled his car into the Bethlehem Steel plant just in time to see the Daniel J. Morrell reaching the Buffalo breakwater on Lake Erie, a short distance from the plant's Lackawanna loading dock. It was eleven in the evening of November 26, 1966. Hale, a twenty-six-year-old watchman on the bulk carrier, had missed the boat—quite literally—on other occasions, but never with so much riding on it. If he failed to make this last trip of the season, he would be forfeiting his annual bonus, vacation pay, and extended vacation pay, adding up to a loss of six to seven thousand dollars. Hale had not been home for Thanksgiving. He could have accepted this as part of the downside of working on the lakes late in the season, but when the Morrell was sailing on the return trip to Lackawanna, New York, the boat's master, Captain Arthur Crawley, learned that the Morrell would be required to return to Taconite Harbor, Minnesota, for yet another load. The Morrell, along with her sister ship, the Edward Y. Townsend, would be substituting for the stricken vessel. The additional voyage would be the Morrell's thirty-fourth run of the shipping season. There was no reason, other than carelessness and bad timing, for Hale's not being on the boat. When the Morrell had arrived at Lackawanna, she could not immediately unload. Two freighters were ahead of her at the dock. Hale viewed this inconvenience as an unexpected opportunity: his Ashtabula, Ohio, home was only three hours away, and since it took nearly eight hours to unload the average freighter, he estimated that he could drive home, see his wife and spend the night in his own bed, and return to Lackawanna in plenty of time to be back onboard the Morrell before she sailed for Minnesota. Hale left as soon as he found someone to cover his watch duty. John Groh, a twenty-one-year-old deckwatch on the Morrell, hitched a ride with him. Hale, it turned out, miscalculated how long it would take to unload the boats—and Crawley's determination to leave the docks as soon as possible. The Lackawanna-Taconite trip was a long but familiar haul. This one promised to be a little rougher than most. Weather forecasts called for stormy weather on Lake Erie, and Crawley ordered water added to the Morrell's ballast tanks. The extra weight would allow the Morrell to ride lower in the water, giving her better stability. The smallest and shallowest of the Great Lakes, Lake Erie was notoriouis for the ferocity of its late-autumn storms. As soon as they knew they were stranded, Hale and Groh visited the Coast Guard station and radioed Crawley. Crawley had little choice but to accommodate the two tardy crewmen. Already short-handed in his crew, Crawley wanted the two onboard. The Morrell, he told them, would be taking on a load of coal the next day at Mullen Dock, near Windsor, Ontario. Hale and Groh could rejoin the crew at that time. Hale assured him that he would be there. 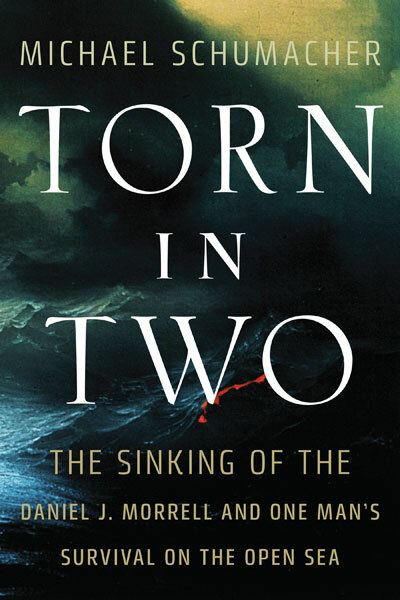 The University of Minnesota Press is giving away advances of Torn in Two. Sign up for a chance to win here. Deadline for entry is June 30, 2016. In addition to Torn in Two, Michael Schumacher has published three previous books about the Great Lakes: Mighty Fitz, about the sinking of the Edmund Fitzgerald; The Wreck of the Carl D., about the loss of the Carl D. Bradley; and November’s Fury, an account of the Storm of 1913, the deadliest in Great Lakes history. Dharma Lion—his acclaimed biography of Allen Ginsberg—will be reprinted by the University of Minnesota Press this summer. He recently edited The Essential Ginsberg and is currently writing an account of the 1968 presidential election, also to be published by Minnesota. He lives in Wisconsin.